Before some empty misnomers such as “prestige horror” are bandied about, let’s be clear: this is not a horror movie. But what A Ghost Story is not hardly matters when what it is remains this beautiful. Writer/director David Lowery has crafted a poetic, moving testament to the certainty of time, the inevitability of death and the timeless search for connection. Opening with a telling quote from Virginia Woolf’s short story “A Haunted House,” Lowery shows us Casey Affleck and Rooney Mara as a loving couple at odds over whether to move from their current house. She wants to, he doesn’t. 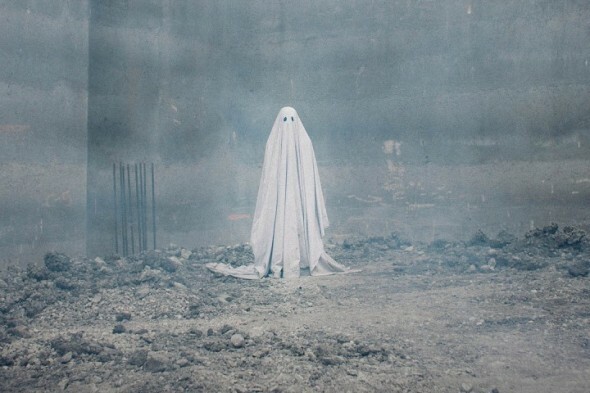 A car accident tragically takes his life, and as her life must move on, his spirit rises to wander as the silent, white-sheeted embodiment of any number of homemade Halloween costumes. The irony of such a childlike image representing themes so vast and existential seems silly, but only for a few moments, until Lowery’s stationary camera and long, elegant takes wrap you in a strangely hypnotic trance. After the curious detour of Pete’s Dragon last year, Lowery returns to the dreamlike imagery that drove his richly rewarding Ain’t Them Bodies Saints and evokes the best of Terrence Malick. Here, the Malick comparisons may be even more apt as A Ghost Story‘s narrative is loose and abstract, with long stretches of little to no dialogue. Both Affleck and Mara (also Lowery’s leads from Bodies Saints) are deeply affecting, though a big part of the film’s conscience is instead revealed through the monologue of a random one-scene character. That’s fitting, for what makes this film so eerily touching is not what it tells but what it shows, and our ache for the couple comes in part from their staying out of our reach. As the ghost travels through time and circumstance, it’s easy to see Woolf’s short story as a major inspiration for Lowery – right up to the sudden and glorious finale that’s sure to fuel plenty of conversation. Restless spirits amid the slow, silent march of mortality may sound like a horror show, but A Ghost Story is anchored by a loving hope that might bring a tear to the eye.